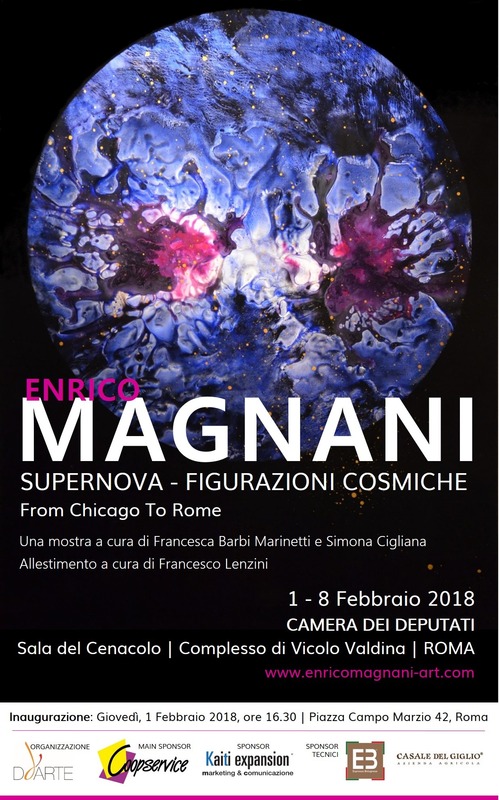 The "Supernova" pictorial cycle summarizes and reconciles for the first time ever the duality of science and mysticism present in Magnani's entire artistic production. The artist aims to bring attention to the phenomenon and consequences of the huge nuclear explosions that characterize the end of a star's life: the Supernova. All the material released by the explosion is at the origin of the formation of new stars. The supernova thus poses as a symbol of death and rebirth, and the cyclic nature of the universe. But there is more. In these spectacular cosmic events, elements heavier than iron are formed, thanks to which, life as we know it, is possible. That is why we can say that Supernova contains in itself a meaning that goes well beyond astronomy. From the chaos of the explosion aggregates of more and more ordered matter will slowly take form, giving birth to life and ultimately to man: the arrival point of creation and the material universe. In these works, the perfection of the geometric lines of the triangle, the circle, and the cross dialogue with the chaos of the explosions of color, creating a balance between order and disorder. These geometries are part of the cultural and spiritual heritage of humankind, of that essence that, recalling Plato, transcends matter existing only in the world of ideas. Remembering that everything is in everything, Supernova unites macrocosm to microcosm, universe to man, science to mysticism. A hymn to life, its complexity, and its magic. From a technical point of view, this pictorial cycle introduces a remarkable novelty. It is created by using the properties of air and water, in addition to pigment. Although the use of the four elements has always been the backbone of many of the techniques Magnani has used throughout his production, Earth (Yin) and Fire (Yang) were no doubt more present and manifest. Now we find the same duality of male and female, Yin and Yang, but expressed through the dominance of the two dual elements: Air (Yang) and Water (Yin). At no stage of its creation has the painted surface been touched by the artist using his hands, brushes or other instruments. Throws of color, sprays, water jets, and air produced the shapes and colors from which the artworks are created.